This classic torchiere floor lamp features a bronze finish and four tiers of lighting with square-sided white glass shades. 72 1/2" high overall. Base is 11" square. Each glass is 4 3/4" high and wide. 29 lbs. net weight. Uses four maximum 60 watt standard base bulbs (not included). On-off foot switch controls all lights at the same time. Measurements to top of each glass is 52", 59", 66", and 72 1/2". 8-foot brown cord. 20" of cord from base to foot switch. Torchiere rustic farmhouse floor lamp with 4 lights by Franklin Iron Works. Bronze finish. Metal construction. Square-sided white glass. Appearance and material from which the item is made. Also, the four lamps will provide abundant lighting. Looking for enough light for a corner in our new living room that does not have overhead lighting. Also, with our high ceilings we were looking for a 6' or taller piece. This should meet our needs perfectly. Love the design! Have one already and like it. Complements existing colors and décor of den. I like the way it looks and would be nice in our place. 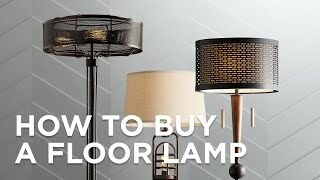 I have been looking for a floor lamp to finish off our newly renovated living room. This one just did it for me. I like the design and the size. Plus with $100 off, and LampsPlus behind me, I could not go wrong!! WE REMODELED OUR LIVING AND DINING ROOM. WE PURCHASED A CHANDELIER & WALL SCONCES FROM ANOTHER COMPANY WHOM DOES NOT MAKE FLOOR LAMOS. THIS DESIGN WILL FIT IN OUR DECORATING SCHEME. We have been looking for a floor lamp for over a year...so happy I opened my email from you and found this floor lamp. I am sure we will love it. Perfect style for my husbands desk. Doesn't take up a lot f floor r desk space. Parents have this lamp and we love it. Gives needed light in corner and has modern style which we like. Because it looks amazing and has four lights for greater brightness. love the style and height of lamp. I have other Franklin lamps, and this is the perfect addition for a strange corner near my sofa. Modern update matching table lamps. Returning customer. Strong light, great design, good price. Goes well with dining room fixture previously purchased from Lamps Plus. This is a second one. I liked the first one we bought. Love the style which matches the Mission style in out living room. Also noted the favorable reviews. Previous favorable experience with Lamps Plus as well as with Franklin Iron Works. Already have one just like it. Want a 2nd one. This is one of the last item to complete our living room make over! Matched office furniture - Starmore Collection from Ashley Furniture. Our entertainment center consists of squares and rectangles and is black with shelves that hold objects that are mostly white. This dark bronze with white torchiere floor lamp should enhance the entire effect. Already have one and we love it. I have 3 already! Love them! Is the floor dimmer included with this light style 22087? Can you dim this lamp ? BEST ANSWER: The lamp has an on/off foot switch. I have included a floor dimmer that is compatible with this lamp (for use with incandescent bulbs only). Not the one I ordered. Do u have to have all on at same time? BEST ANSWER: Hi - Yes, this includes an on-off foot switch which controls all the lights at the same time. Yes, all the lights are lit or off. I imagine that you could remove a couple of bulbs or use dimmer bulbs. I, however love the light it provides for reading. I think is was a spectacular buy! Great floor lamp! I use Phillips hue lights with it. Although the lamp itself has only one switch, you can control hue lights separately. All of the lights are either off or on. Do you sell replacement shades for this floor lamp? A note in the box said the wiring had been updated so can use newer kind of blubs. Does that mean halogen, LED, compact florescent? BEST ANSWER: Hi Betsy - Yes, you can use CFL, halogen, incandescent, or LED bulbs with this floor lamp. We purchased the bulbs they suggested on the website when we ordered the lamps. They’ve been going strong for over 2 years so I would suggest you get them—they work great. Can I purchase Replacement of glass covers? Can you order replacement light bulb covers? My movers lost all four of mine. BEST ANSWER: The floor lamp weighs 29 pounds. Hi. Is there any way I can order the glass covers only? Does the standard A19 LED bulbs fit in to this lamp without popping out of the shade? BEST ANSWER: The recommended light bulbs are A15 and bulb Style #91833. I have this lamp and love it. However, one of the glass shades broke and I need a replacement. Is this possible? Does this lamp currently have a dimmer switch option? Why will this dimmer work only with incandescent bulbs, and not iwth dimmable LED? No dimmer switch, all or nothing. I love this lamp, even without a dimmer switch! Where is the cord on this lamp? Does it come out at the bottom and not visible higher up? BEST ANSWER: it does come out at the bottom. The cord has a switch on it that can reach up and over the first rung, It is kind of a button that you push in. Its a little weird but it works ok. The lamp is very bright with all three bulbs and lights up the room greatly. Yes - the cord is at the base. The on and off button is attached to the cord as well. So the best way to turn it on and off is to push it with your foot - otherwise you'll need to bend down. I personally love the design. Yes, the cord comes out the bottom and the switch is on the cord -- big button meant to be activated using your foot. It is only on or off -- the switch doesn't turn on each bulb in successino. It comes out one side of the base. There’s a switch a few inches down so it sits on the floor and you step on it. Yes, the cord is at the bottom. I bought two of these a year ago. Have absolutely loved them! It comes out the bottom and is not visible higher up. Is this available with clear glass, not frosted sconces? BEST ANSWER: I'm sorry, there are no other glass options for this fixture. Can you adjust the height of each? BEST ANSWER: Each light on this lamp is at a fixed position. If you'd like to be able to adjust individual lights, and also keep with the linear style of this design, I have attached a recommendation below. It's a torchiere style light with two adjustable side lights. Hope that helps! No, you cannot adjust the height of the lamps. Also it's all or nothing with the lights. That being said, this is the most beautiful and sturdy light I have ever owned. It is very elegant looking and gives off a great deal of light. I highly recommend. I actually am thinking of getting another one I love it soooo much!! No you cannot adjust the height. They are all fixed. No, the height is fixed. No adjustments can be made. I bought this lamp 2 years ago and I absolutely but the shades were broken during a move. How do I get replacements? BEST ANSWER: Please contact one of our lighting specialists via phone, email, or chat. They can assist you in placing a special order for the glass if it is available. Can you turn on one or two light or do all 4 lights have to be on at same time? BEST ANSWER: Unfortunately the switch is "all on" or "all off". Also, the switch is midway on the cord -- designed to be operated with your foot, cord on the floor. I would have preferred to have a switch on the lamp itself. But I do still like the lamp very much. All or nothing...I bought the recommended bulbs and they are quite bright. Lights up not just the corner, but the entire room. Really nice sturdy, high quality light. I highly recommend. Single switch turns all bulbs on. I ordered the lamp dimmer to use with it and will order more for other lamps. The dimmer is the perfect solution! There is only one floor switch, so all four work together. I have two of these and love them. All 4 lights are either on or off. Push switch is part of the power cord. I love this lamp, because it is so stylish and elegant. I have it next to the fire place and it really helped brighten my dark living room area. I like the floor dimmer switch a lot, too. The only downside is that the floor dimmer switch only provides on-off functionality with certain fluorescent bulbs. Note: some energy-saver bulbs are too tall and would stick out. I found some that came in a two-pack at Lamps Plus that were just the right size. I purchased two of these lamps for my living room, which has no overhead lighting. Each socket is rated to hold up to 60W, so each of these lamps gives off 240 W of light. However, after about 18 months, the foot switch broke. I called Lamps Plus and they do not carry a replacement switch. After some research and follow up, the Atanya from Customer Service got back to me and sent me 2 replacements foot dimmer switches. She went the extra mile to send me photos that she and the technician took with step by step instructions on how to replace the original switch with the replacement dimmer switch. Made it very easy. However, an electrician told me that the original switch that came with the lamp is only designed to handle a total of 200 W of electrical power, which is why it failed. Can't understand why a switch would be put on a lamp that cannot handle the load of the lamp. And there was no warning to that effect. I have now replaced my original bulbs with LED bulbs to keep the wattage down. Like it OK but don't love it. I thought I would really love this lamp. I bought it for a dark corner of a home office. I wish the glass shades were thicker or had a thicker frosted coating. I also wish I could select how many of the lights to have on at a time--it's either all 4 or nothing. When using 60 watt bulbs in all 4 and it is on, it is so bright that it is uncomfortable (for my eyes anyway) to look in the direction of or at the lamp. I switched to 40 watt bulbs and that helped with that issue but then I lost the amount of light in that corner that I was looking for. Also, the metal shade bases on a couple of the lights are crooked/uneven. I wound up turning the glass globes to diagonal to the bases so the unevenness is less noticeable. All in all, the lamp simply did not meet my expectations but I decided to keep it anyway because I got it on sale and it was difficult to get it home (I have a small car). I bought these to replace the old college torchiere lamp that needed a final resting place. They are beautiful but do need a dimmer option. The height is great. It's difficult to find something that looks artistic, transitional yet illuminates appropriately. Packaging was not well done on one lamp. Customer service replaced the broken globe no questions asked. Instructions were to dispose of the broken globe. I appreciated that feature of the service! I had a dark corner next to my bookcase in the living room that needed better illumination. The light tree torchiere did the trick and made it a better spot to enjoy a good book. Picked up the light at the Pasadena (CA) store at time of purchase. Unfortunately, the box (very large) would not fit in my vehicle. My salesman and the stock person, unboxed the lamp for me and got rid of a lot of the unnecessary foam inserts and wrappings. With some basic wrapping on it, we were able to get our purchase home. Appreciate the help on that! I love this design for the way it updates classic Mission, Arts and Crafts lighting with four tiers of glass! Please note that in compliance with new energy efficiency rules, this design no longer comes with the floor dimmer that was included on earlier versions. In order to make the lamp as environmentally friendly as possible, we've re-designed it with a handy on-off foot switch that is compatible with CFL bulbs. If you choose to use the lamp without CFLs, a full-range dimmer for incandescent bulb use can be purchased separately. About Lynda: Lynda is an award winning Certified Interior Designer with over 25 years experience in high end residential and commercial projects. She lives and works in the Southern California area. I bought this lamp about 4 years ago and loved it. When I saw they still had it I bought another but the quality has been cheapened. Biggest complaint is the white shades look like plastic and they don't sit on the frame straight. Wish I would have returned it - don't think this one is worth the price. Lamps look great from a distance but within 20 feet you realize that the great lines are disturbed by the 4 light bases are not level or aligned with each other. It is also poorly packed so expect damage on the bases as there is only a small amount (<1") of styrofoam protecting the heaviest part of the lamp. Our dark, difficult to light living room corner is now beautifully illuminated. Our post and beam ceiling does not allow for overhead lighting and this was the perfect solution-after working with several table lamps that weren't quite right for the area. It also provides additional reading light. I couldn't be more pleased! The shipping box and foam was destroyed by the time it got to the house, nothing was damaged however. Nice looking light that throws off a lot of light with a minimal footprint. This lamp is cool looking, beautiful and modern. The 60 watt bulbs are way too bright for this lamp. It was like being on stage. They hurt my eyes. We changed to 40 watt and it's much better. The foot switch is very convenient. The glass shades are a bit rough on the edges and almost sharp in places. Take care when adding the bulbs. But still worth it. The lamp is a great value. I'm very pleased. We use this next to the recliner in the living room where there is no table lamp. It is very bright and a great design. It would be even better if it had a three way switch so you could dim it when you want less light. For a lamp in this price range, there is no excuse for it to have a one way switch when there are four lamp heads. Box was damaged - cardboard was ripped and taped back shut. Lamp was not damaged, luckily; glass globes did have small scratches, but one call to customer service and they sent out all new globes. Also, dimmer switch was missing - still working with customer service on that. Love the look, really brightens the space. The foot pedal came broken,lots of work only to take back. The on/off pedal is a great idea as an alternative but should have the capibility to turn on/off the lamp. The lamp itself is a good, attractive product however after only 1 year and 4 mos of very infrequesnt use (1 - 2 times per month)the foot controlled on/off switch has broken. Due to the location of the switch I now need to re-wire the lamp. Lampsplus does not offer a replacement cord/switch for purchase. Very disappointing for a not-cheap lamp. Bought this with a dimmer switch and absolutely love the look and the light adjustment for this space. One of the glass shades was broken when I got it but I called the number provided and a new one was shipped right away with no trouble! We have this in a living room corner. We're using 40 watt little round bulbs and it provides excellent illumination with the dimmer function. I wish the cord were longer to the dimmer switch. I used this lamp to replace a 500 watt Halogen Torchiere. I bought 4 40 watt equivalent LED bulbs for it. It gives plenty of light in my large balcony room. I would have given 5 stars if it was equipped with a dimmer. "A light for every occassion"
Loved the fact it could be as light or dark in the room as required. Have large room and have two fixtures and no other lighting is needed. The style makes it easy to place in several different room situations. The shades are fragile. Two were broken in transit. They will be difficult to clean. But the lamps are quite elegant and provide a lot of light. I like them a lot. I wish the companion table lamps were more like the two I bought. If you like the style you won't be disappointed however, when they say "bronze finish" what they really mean is brown. I purchased this to match tarnished and rusitc colored metals. During daylight the dark, matte brown paint color is very apparent. No metal-esque finish here. Otherwise, the design and light out-put is great. P.S. Buy shorter than standard bulbs. I love the look of this modern design in my apartment. My only complaint is that it is a little difficult to dust. It is sturdier than most floor lamps. Best service ever! I was on a time crunch to pick up my son from school. I called five minutes before arriving and the rep pulled and placed the item in my car. I was in and out within five minutes! Easiest shopping ever! I placed this lamp in my living room and it is plugged into an outlet that has a wall switch when entering the room. I like that I can keep in on dim for general on/off usage, and raise the light when I need more light. The foot dimmer is great. Remodeling my living room which is the front room of the house. This room is rarely used and I am thinking about coverting this room into a reading room. 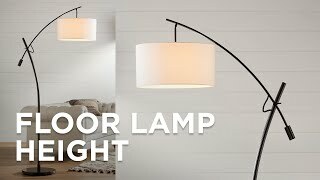 This lamp is perfect for the corner of the room and will give ample light for reading or accent lighting using the dimmer switch when entertaining. I can't say enough about this lamp. It's cool looking and has great illumination. Most of all, it fits the decor in my den to a tee. I have dark wood furniture that leans toward the contemporary side. The lamp catches everyone's eye when they walk in the room. The dark metal accented by the white shades is a head-turner. I love the dimmer switch, too!!! I've got tall ceilings, so the taller height works well for me. Very easy to assemble. I bought this lamp about 8 years ago and was delighted to find it again at Lamps Plus so now I have two! This lamp fits nicely in a corner area of our living room with has 12 foot ceilings. 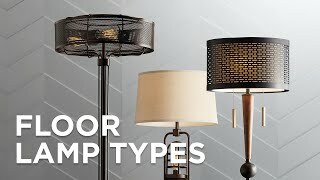 All other floor lamps where either too short or too bulky to fit in corner area. This lamp is just perfect. Unique and comtemporary in style. Get lots of compliments. Just LOVE it!! Product is boxed in 2 separate crates. One for the glass squares, which is reasonable in size, the other for the metal lamp structure. Since the metal structure does not disassemble, this box is very long. Customer service was excellent and removed the box to allow me to fit the lamp in my mid size car. Delivery was prompt and was delivered in good condition. Quality construction in this modern design lamp. Well executed design with dark bronzed iron and frosted glass give this floor lamp a nice blend for contemporary decorating. This lamp has got to be one of the sharpest made that I have ever seen. Just simple elegance...there is nothing else to say about it. It goes with absolutely everything. The floor dimmer switch just makes it all the more exciting. The lamp is set up in my living room area. It goes great with my living room furniture and the design is great. I love the fact that the lamp has a dimmer switch. I can make the area as bright or as dim as I like. Good price as well. Arrived in good condtion with minimal setup. This floor lamp was an awesome purchase for a dark corner of our family room. I love the way it goes from dim to bright with the touch of your foot. It has been a wonderful conversation piece. Good price when it was on sale $80 off. Love this floor lamp Solved our problem! The moment i set eyes on this lamp i knew this was the one i wanted to adorn my corner of the staircase with.It was a perfect spot to "tuck" this beautiful lamp into and when lit it makes my whole home look so radiant and gorgeous--not only lighting up my living room without the need for any other lighting but also my stairway to the upper floor! Wish i had a bigger home to use more of these lamps! When I first got this lamp one of the metal parts were slanted and it did not come with a dimmer like all the reviews said. So I called customer service and they were so helpful. They had a delivery service pick it up and exchanged it for a new lamp that was in perfect condition in no time. I was more than impressed with the way Lamps Plus handled their product complaint. Now I am very happy with my purchase and will purchase my lamps from this company from now on! Does the job and looks great, too. This light does it's job - it illuminates well. The newer model (with no dimmer switch) allows you to use energy efficient bulbs (which will throw off less heat as well). It's a great buy for such a designer look. We own a contemporary "Frank Lloyd Wright" inspired house. 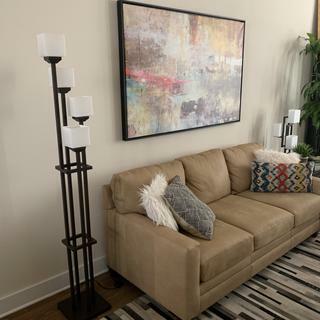 This floor lamp is the perfect balance of a traditional "mission" style and a modern design. It is very sturdy and well made. The weld joints are smooth and the finish is a rich matte bronze. I use director bulbs so most of the light goes up rather than out the sides, without leaving a visible line found in a regular reflector flood spot. I've read complaints about this product and the other Possini Euro lamp I own from people who think the lamp should allow for only one or two bulbs to be on at once or to have a built-in dimmer. I solved the issue easily by purchasing a lamp dimmer. I have this one: Lutron Credenza/C•L White CFL/LED Table Lamp Dimmer (R4085). It works perfectly and allows me to use full wattage or dim to lower lighting by just sliding the switch. This lamp is beautiful. (The other Possini lamp I own is fantastic, too.) I love that it takes up very little real estate but provides a lot of light. To me, the style is timeless. I'm a big fan of Mission design, but this lamp would be great in a modern or Asian setting, too. The lamps appear to be well made and sturdy. I hope to enjoy them for years. This light is so elegant and well made. It is very stable. The shades are a nice weight of glass. Nothing but praise for this piece. I am thinking of getting another I love it so much!! Artistic lamp is fun and illuminating! I absolutely love this lamp. I bought an accompanying dimming switch so I can filter the intensity at times when less light is needed, but I've found that this lamp completely brightens my entire living room! I do not have overhead lighting, but with this lamp I honestly don't even miss it. This is an awesome lamp!!!!! This is a beautiful lamp. Everyone that comes over comments on it. Lamps Plus is great to work with. This lamp arried in a box that had been attacked by FedEx and when I opened it, one of the shades was broken. I called in to customer service and a new shade was shipped to me within a week. Awesome people at Lamps Plus! I wish there was a store where I lived. If you are thinking of getting this lamp, just do it!! No regrets.